I’ve made a lot of Thanksgiving dinners over the years, enough to know the importance of pre-planning and not being overly ambitious with the menu—something I’ve struggled with given my weakness for many of the dishes associated with this favorite meal. Practice has made me pretty good on the planning and strategizing end of things—I now know to cook, chop, shred, slice, and purée as much as possible in advance of the big day—but things have proven more challenging when it comes to determining which dishes will be included; I always seem to over-do it. Of course, part of the traditional Thanksgiving experience is having too much to choose from, and therefore too much on your plate, and I’d be the last one to suggest changing that. But each year I feel as though I could have done with maybe one less dish… or two. Certainly it would help where the time and labor is concerned, and maybe I wouldn’t end the day with a stomach ache! So lately I’ve been giving some thought to where I might trim the lineup, and the one area I keep landing on is dessert. Seriously, does anyone really have room for multiple slices of pie after eating several platefuls of turkey, cranberry sauce, and all those sides? Okay, the answer from some of you may well be a resounding yes! But for others who feel as I do, a bite or two of a pecan or pumpkin something-or-other may well be all you need to cap off the meal. Which brings me to this week’s posting, for pecan shortbread bars. In concept they’re exactly what I want after an overindulgence of turkey—a concentrated shot of chewy, buttery sweetness that’s gone in two big bites. And, of course, for those of you whose cravings veer to the sweet side of the spectrum, there’s nothing to stop you from grabbing a second or a third bar. Which is, in fact, a risk here, since these little treats are kind of like a Thanksgiving candy bar, if such a thing existed. In other words, they have an addictive quality that makes them hard to stop eating. While the shortbread is doing its thing in the oven you can address the topping—which is just as simple. There’s the chopping of the nuts in the food processor (a few pulses will do as you want these to be coarsely chopped and not transformed into pecan powder—something that can happen very quickly), and the assembly of the honey/brown sugar mixture, which once baked functions as a chewy vehicle for the nuts. 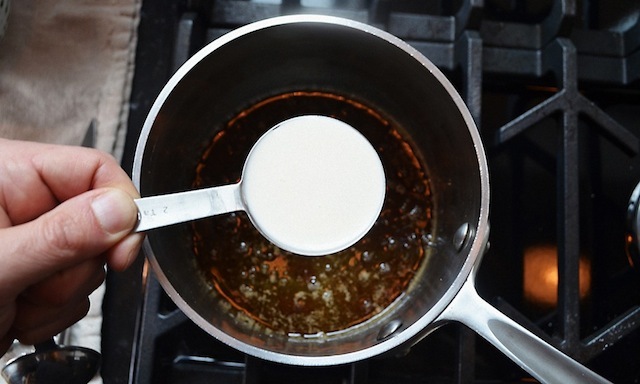 This latter element involves melting the butter in a saucepan, adding the cup of brown sugar, the 1/3-cup honey, and the two tablespoons of heavy cream, then simmering the mixture for a minute until it’s well blended. Once this step is complete, in go those chopped nuts, which are folded into the honey/brown sugar mixture so everything is well coated, with the resulting mixture then spread across the surface of the warm shortbread, using a spoon or spatula to make sure it’s evenly distributed. 20 minutes in a 350˚ oven (the surface should be bubbling) and the confection is ready—though be sure to allow the baked shortbread/pecan mixture an hour to cool completely before slicing it into 24 bars. I did make one addition to the recipe, in the form of a chocolate drizzle. While the bars are plenty wonderful without it, I figure if I’m going to eat pecans and brown sugar I might as well go for the gusto and do it with a little chocolate. 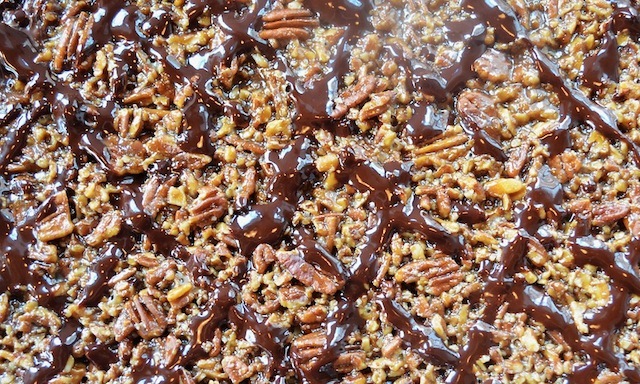 If you feel the same then melt a bar of semi-sweet chocolate in a double boiler (break the bar into small pieces first), stir in a few teaspoons of unsalted butter, and once melted drizzle the results across the surface of the baked pecan mixture. (I drizzled horizontally, starting in one corner of the pan and moving towards the opposite, then doing the same from the other side—an approach that resulted in a nice diamond pattern.) And to make sure the chocolate hardens up sufficiently, once the pan is cool to the touch, place it in the freezer for five minutes or so. Supposedly the bars will keep for five days at room temperature, though I haven’t put this to the test as mine were gone in just twenty-four hours. Whether you include these in your Thanksgiving dessert lineup, or make them for some other occasion (they’d make a great Christmas cookie) I suspect the same will be true for you. The combination of chewy and crunchy with sweet and a little salty is just too good to resist. 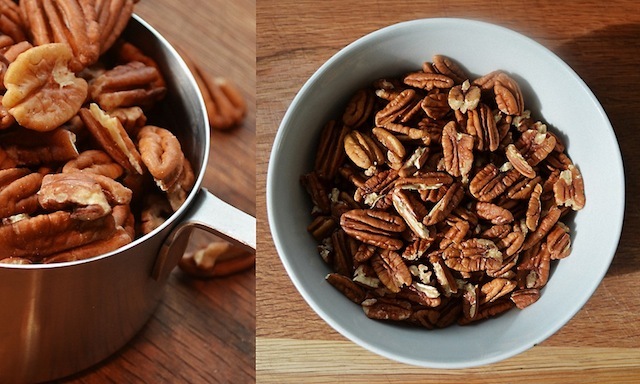 —In a food processor coarsely chop pecans. —In a heavy saucepan melt butter and stir in brown sugar, honey, and cream. Simmer mixture, stirring occasionally, 1 minute, and stir in pecans. 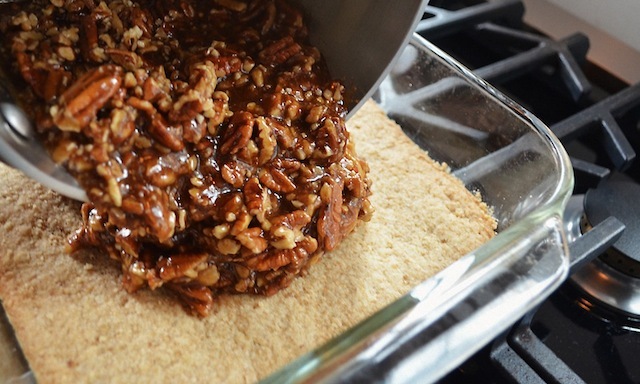 —Pour pecan mixture over hot shortbread (see instructions below) and spread evenly. Bake in middle of oven until bubbling, about 20 minutes. —Cool completely in pan and cut into 24 bars. —Bars keep, covered, 5 days at room temperature. —TRG Note: If you want to add a chocolate drizzle to the bars, melt chocolate and butter in the upper portion of a double boiler. 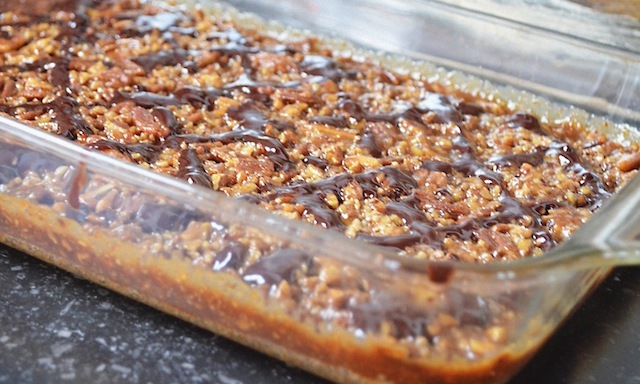 With a teaspoon, drizzle baked and cooled bars with the melted chocolate. 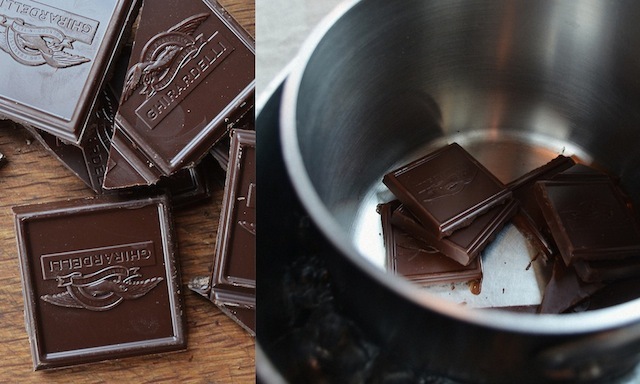 Place in freezer for about five minutes for chocolate to harden before proceeding with slicing. 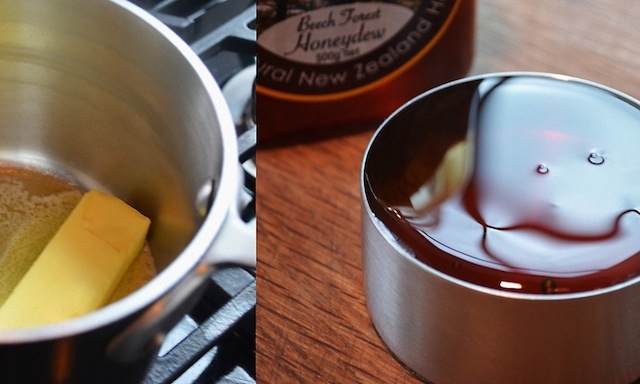 —Cut butter into ½-inch pieces. 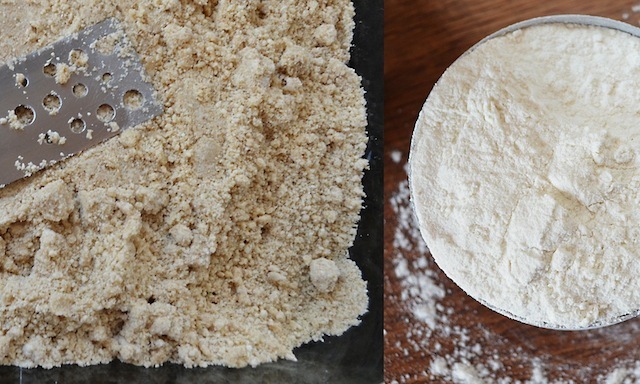 In a food processor process all ingredients until mixture begins to form small lumps. —Sprinkle mixture into a 13 x 9 x 2-inch baking pan and with a metal spatula press evenly onto bottom. Bake shortbread in middle of oven until golden, about 20 minutes. 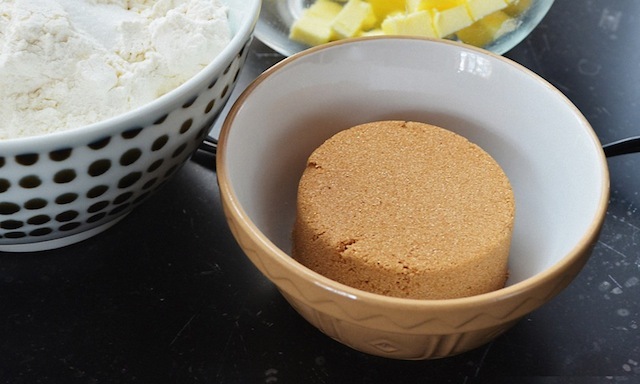 —While shortbread is baking, prepare topping. 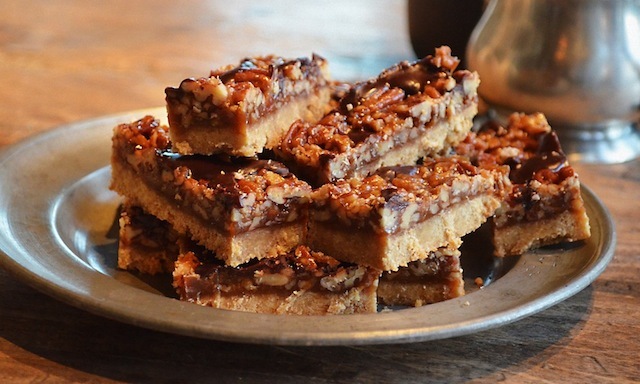 Here come the holidays and these pecan shortbread bars will be top of my baking list. I best be doubling up my gym time - thanks again to TRG!!! These look amazing! I want to make them.